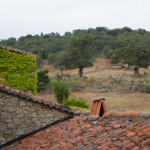 Tucked away in a little corner in northwestern Extremadura and bordering Portugal lies Sierra de Gata. This mountainous and sparsely-populated land is one of the region’s remotest areas, studded with beautiful little villages that would make any rural tourism lover rub their hands with glee. 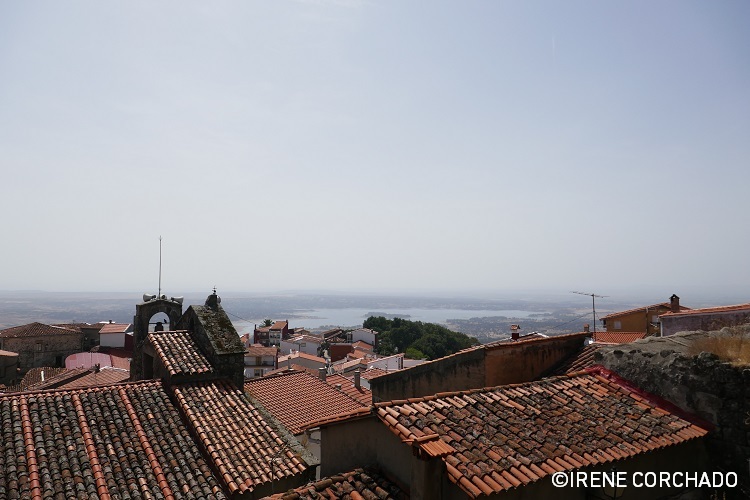 This is exactly where we headed to in our recent visit to Extremadura, and the first stop in our road trip was Santibáñez el Alto. Santibáñez el Alto is not easily accessible. Located on top of a hill at 650m over sea level, it’s said to have been founded in the 9th century by a countess of French origin who was looking for a place to hide from persecution. Even today, local transport (bus) won’t get you far. 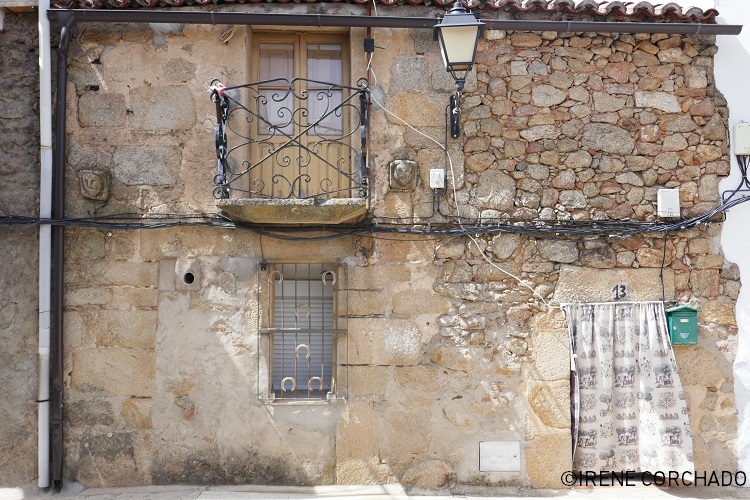 There’s only one service a day, not every day, to nearby villages and Coria – a decent-size town only 40km away. Therefore (unless you want to do a hundred changes on a never-ending journey), it’s safe and sensible to say it can be reached by car only. For a town this tiny (339 people) with barely 20 streets in total, Santibáñez has an unusually high concentration of places named after fascists. There is a square named after dictator Franco, another square named after general Mola, and streets named after likewise fascists José Antonio (Primo de Rivera) and general Queipo de Llano. This goes against a law passed in 2007, which some local authorities seem to be taking a bit too long to comply with. 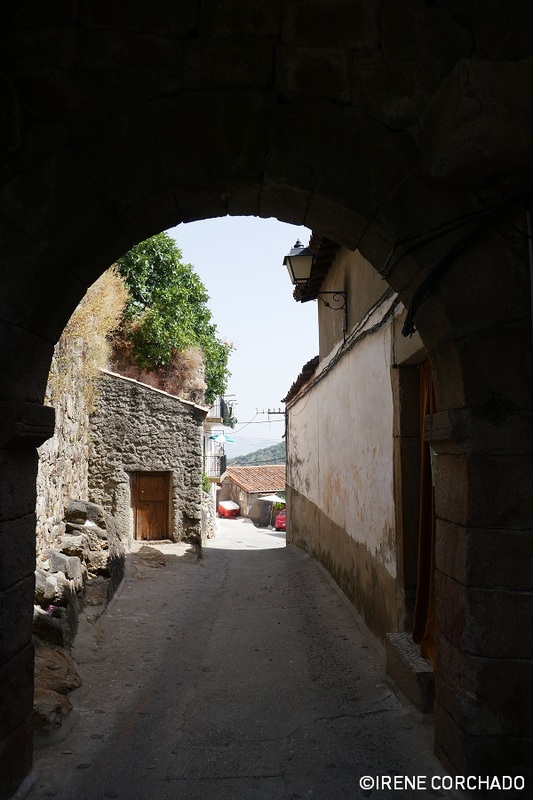 We arrived in Santibáñez el Alto on a really hot Sunday afternoon after a three-and-a-half-hour drive from Madrid airport, where we had hired a car. In rural (and not so rural) Spain, Sunday means closure. All shops are closed, so you need to plan accordingly and buy water and snacks at service stations on the way, just in case. 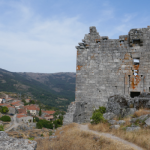 Our plan was to wander around a bit, walk up to the castle remains to enjoy the view, have lunch and check out a series of abandoned farmer stone houses south of town. Did you know…? Sierra de Gata is similar in size (1,254 km2) to the UK county of Berkshire (1,262 km2) but has a population of just 22,500. Its population density (17.94/km2) is just slightly higher to that of the Shetland Islands (15/km2). 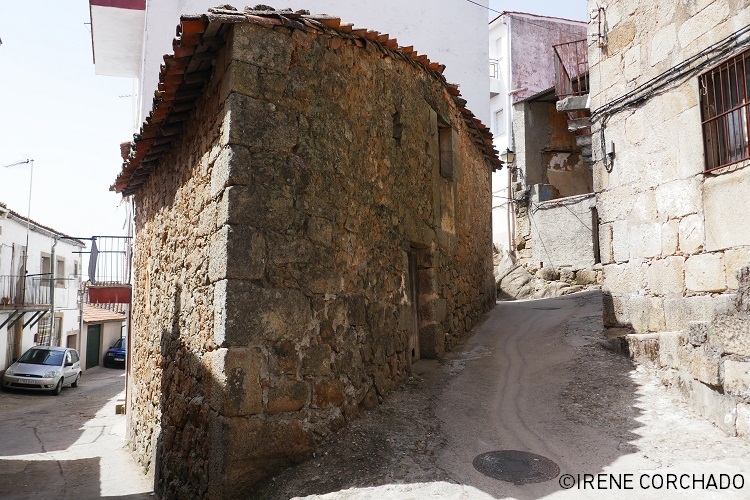 If you ever visit Santibáñez – or any other place in Sierra de Gata for that matter – leave the car in the outskirts. Don’t try to drive through towns and villages, unless you want to get stuck in cul-de-sacs or having to reverse in ridiculously narrow two-way streets when encountering another vehicle. In Santibáñez, the plaza Terragal is a good place to park. On our way up to the castle remains, I could hear the tinkling sound of kitchenware coming out of people’s windows. It smelt of soup, of meat and vegetables. To protect wooden doors from the sun, many locals have resorted to thick curtains with a rural feel. I wonder whether they’re fashionable around here or whether people try to stick to one single style, because they all look like cut from the same cloth. Thick and beige, with burgundy-maroon patterns of animals (deer, partridges) or olive-growing scenes. We passed by a mini-supermarket, a local job training centre and a church – all closed – before reaching little plaza Villa square. There was nobody in sight, not a sound; the silence only unexpectedly punctuated by The A-Team theme tune coming out from someone’s living room. It cracked us up. The square opens up to a small bullfighting ring, built making using of the castle walls. We walked back and when we reached the turn, right before a gate, we saw some steps up to what we expected to lead to somebody’s garden. 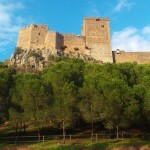 It took us up to the walls, instead, and offered a spectacular view of the surroundings hills and nearby El Borbollón reservoir. As it was getting a bit late, we started walking down looking for a place to eat. 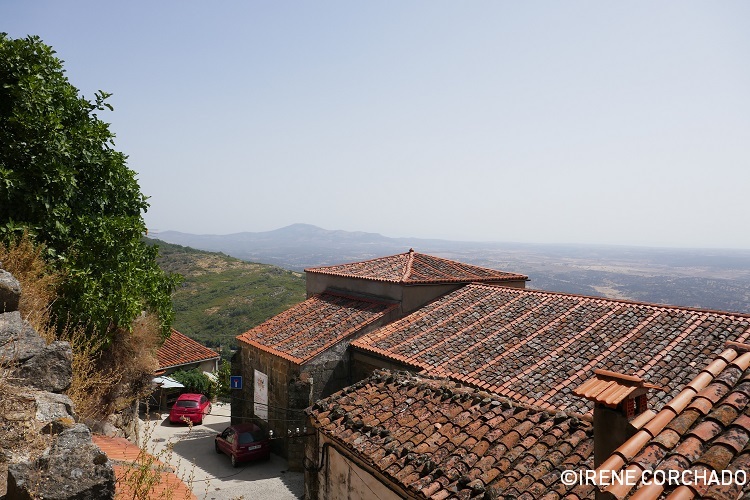 We found a small open space overlooking the hills, with houses lined up on the opposite side. There was a bank and what looked like two bars (but one of them with no name or sign outside). The other one, Café-bar Sonia y Yoli, is the only one appearing on Google Maps. It was quite noisy, and we sat between two groups of people. On one side, there was a group of middle-aged men and a few younger fellas discussing olive groves. On the other side, there was a few couples and a three or four-year old running around signing El conejo de la Lole – a dirty song that refers to a woman’s intimate parts. His parents didn’t seem bothered in the slightest. Nobody came out, so a man from the family sitting next to us approached our table and took drink orders. We asked whether they served any food. There was no menu available. I had the feeling people went there for pre-lunch drinks only and then head home. The man’s sister came out and, not wanting to leave two forasteros starving, she offered to prepare something out of what was available in the kitchen and served us pork fillets with chips, green peppers, fried eggs, calamari rings, and a tomato salad that could have easily fed four people. 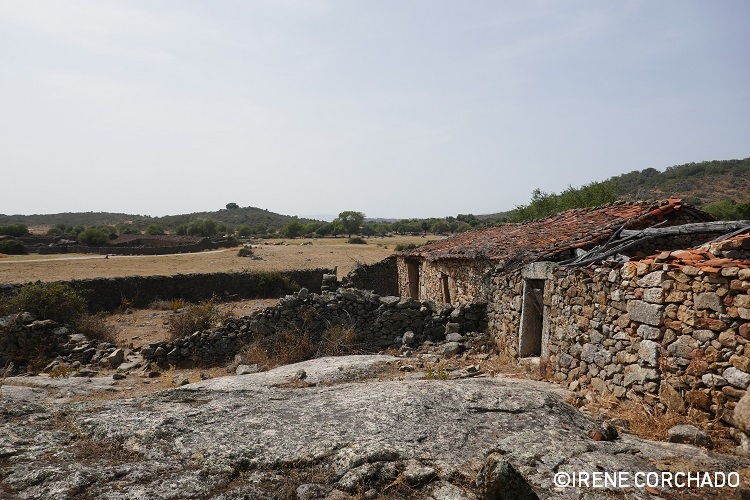 After the big lunch, we walked back to the car and drove to Los Pajares, a series of some 200 abandoned farmer stone houses about 1.5km south of Santibañez. Google Maps directions aren’t reliable, and the place is not signposted in town, so you need to know which way to go. Drive south on C-513 (EX-205 direction Moraleja) and you‘ll see the sign ‘Los Pajares 2km’ on your left. The first part of the road is paved but then it turns into a cross-country drive that make those 2km feel like 10. 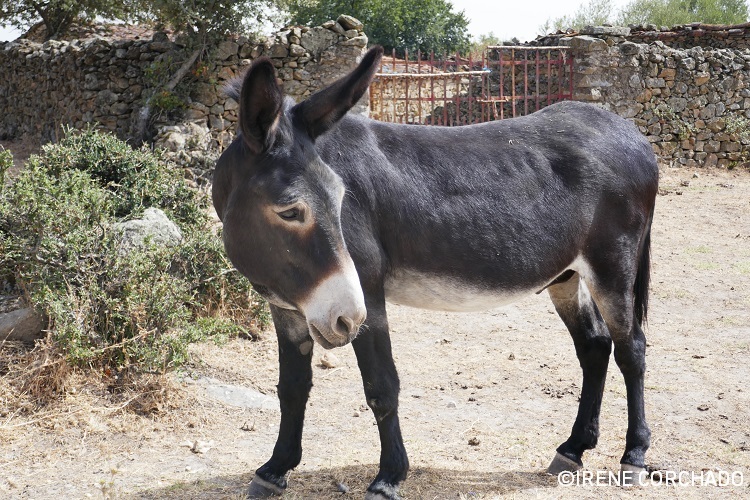 Eventually, you cross a gate and are greeted by a group of cows and horses by a pond and a curious little donkey. 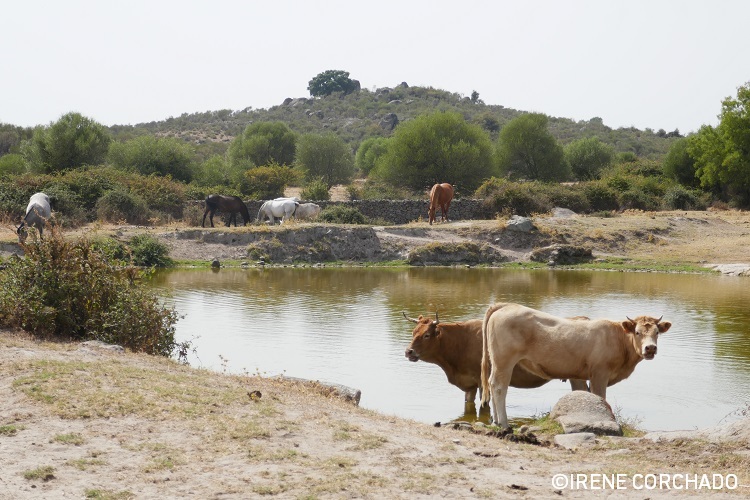 Los Pajares (literally ‘the haylofts’) has been listed as a Place of Cultural Interest, as it is one of the best-preserved farming-related architectural ensembles in Extremadura. 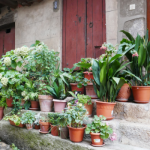 It covers an area of 27ha dotted with small one-storey or two-storey stone houses used by local farmers and shepherds. Its origins are not clear, and the houses don’t display any specific or stylistic feature that could give away when they were built; bearing in mind the Santibáñez foundation date and its importance in the area in the past, the authorities reckon these constructions may date back to medieval times. 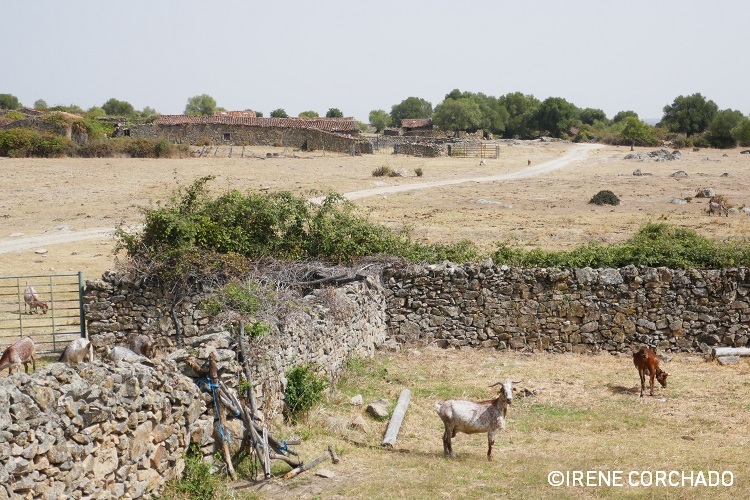 Despite the houses being abandoned, you can see goats in some farmyards and spot the occasional shepherd and his herd. 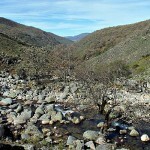 Distance: 40km from Coria; 55km from Plasencia; 107km from Cáceres. 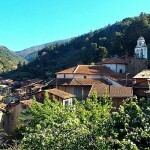 Turisgata and Adisgata offer more info (in Spanish only). If you need accommodation in Sierra de Gata, read my impressions about our stay at El Cabezo, a farmhouse located 38.4km from Santibáñez el Alto.